Last year I wrote an article – Cameron’s Gini and the hidden hierarchy of worth – and I said: On 04 June, 2014, at 3.52pm BST, Cameron said that inequality is at its lowest level since 1986. I really thought I’d misheard him. But of course Cameron lies, that’s an established fact. This isn’t the first time Cameron has used this lie. We have a government that provides disproportionate and growing returns to the already wealthy, whilst imposing austerity cuts on the very poorest. How can such a government possibly claim that inequality is falling, when inequality is so fundamental to their ideology and when social inequalities are extended and perpetuated by all of their policies? It seems the standard measure of inequality is being used to mislead us into thinking that the economy is far more “inclusive’ than it is. A newly published report by the Dublin-based Foundation for the Improvement of Living and Working Conditions (Eurofound) states that the UK has become the most unequal country in Europe, on the basis of income distribution and wages. The report also says that the UK has the highest Gini coefficient of all European Union (EU) member states – and higher than that of the US. The coefficient is a widely used measure of the distribution of income within a nation, and is commonly used to calculate inequality. According to analysts at Eurofound, Britain has a Gini coefficient of 0.404, whilst that of the US is 0.4. Portugal and Latvia followed the UK with Gini coefficients of 0.358 and 0.357, respectively. The average Gini index for the EU as a whole in 2011 was 0.346. Eurofound was established in 1975 to contribute to the planning and design of improved living and working conditions. This role is undertaken in partnership with governments, employers, trade unions and the European Union institutions. The report says that there was a decrease in inequality before the global crisis that was entirely due to a significant reduction in between-country wage differentials (in other words, a process of convergence in pay levels – see: Labour’s excellent record on poverty and inequality – which came to a halt, reflecting the effects of the global crash, in 2008, and then started to reverse towards the end of the period of this analysis, in 2011. My friend, the British economist Michael Burke, observed that Eurofound’s study demonstrates the previous claims by David Cameron that Britain’s economy is recovering from the recession were false. “All of the deterioration in the Gini coefficient in the EU is caused by the worsening of inequality,” he added. The UK now has the worst Gini coefficient in the EU. Gini is the most widely accepted measure of how fairly income is distributed amongst a nation’s residents and is the standard measure of inequality. Cameron, parroting Thatcher, has claimed that there is no such thing as “public money,” indicating clearly that the economic enclosure that was initiated by the Tories under the guise of austerity, affecting the poorest citizens most of all, but leaving the wealthy unaffected by cuts, is going to be permanent. A YouGov survey conducted this month and published on Monday found that most voters in the UK believe the government should prioritize tackling inequality – reducing the gap between rich and poor – over faster economic growth. The findings, which suggest strong public support for redistribution, will complicate the debate about precisely how the Labour Party lost the general election, particularly given the Labour manifesto, outlining strongly redistributive and progressive tax policies, which had disgruntled a number of super petulant super-rich celebrities, who threatened to flounce from the UK if Labour gained office. YouGov found that of the main parties, only Conservative supporters were significantly more likely to care about economic growth than inequality. Bearing in mind that Cameron won with 36.9% of the vote, the considerable gap between the priorities of Conservatives and those of the other parties will most likely mean a difficult five years for the prime minister. 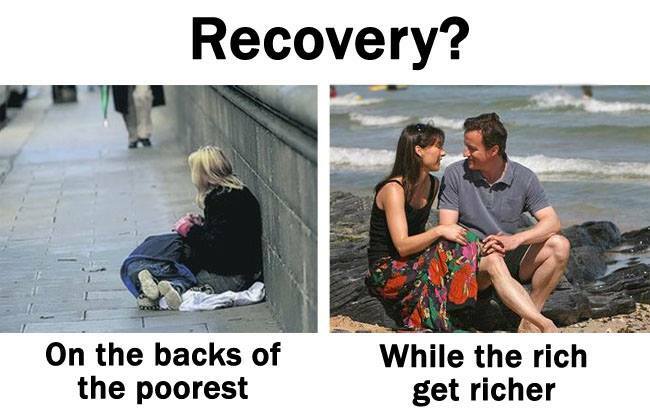 With homelessness increasing by 55% between 2010 and 2014, whilst food bank use has surged, malnutrition and absolute poverty, not seen in this country since before the inception of the welfare state, are becoming more commonplace, and with more draconian cuts planned by the Tories for the already diminished and essential support for the poorest – many of whom are in low waged work – it’s going to be an extremely punishing five years for those already at the poorest end of the UK’s steeply hierarchical society. Last year, I wrote about the study from the Organisation for Economic Co-operation and Development (OECD), who found what most of us already knew: that income inequality actually stifles economic growth in some of the world’s wealthiest countries, whilst the redistribution of wealth via taxes and benefits encourages growth. 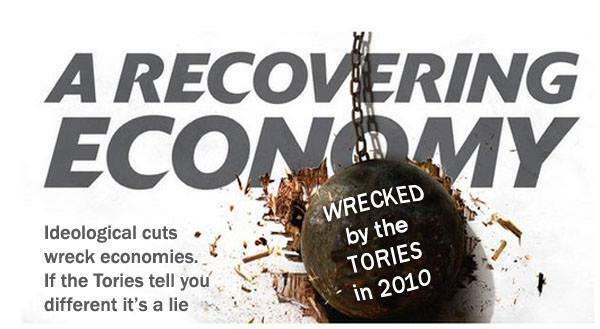 The report from the OECD, a leading global think tank, shows basically that what creates and reverses growth is the exact opposite of what the current right-wing government are telling us, highlighting the truth of Ed Miliband’s comments in his speech – that the Tory austerity cuts are purely ideologically driven, and not about managing the economy at all. But many of us already knew this was so. Watchdog that scrutinises constitutional reform is quietly abolished and Tory proposals are likely to lead to constitutional crisis.